Decides he wants to become a liberal icon, abandons the center. Hello Culture Wars, writ large. Oh, and just when you might have counted the Tea Party out, they oust a 36-year Senate Incumbant... (the guy's been in the Senate since I was born), and came up with a $12.2 Million Haul. It's funny, Carvill just gave this warning this morning to Democrats. James Carville wrote: You can shoot five Bin Ladens, you can save 10,000 banks and 20 car companies, even pass the most sweeping legislation in modern American history; if people don't think that you are connected to their lives and are fighting for their interests they will vote your tush out of office in a nano-second. For historical reference see Winston Churchill election of 1945 and President George H.W. Bush in 1992. Bill Glasheen wrote: It's the economy, stupid!!! Romney will have a hard time repeating Clinton's success given the steady improvement of the economy under the current president's helm. Romney's current strategy is to try to convince people that he could make the recovery go faster, although his track record does not support that. If the current economic trends continue until election time, status quo will give the President the advantage so ultimately Romney is going to have to try to shift the focus to something else...and the witness accounts of his leading a gang assault on a boy in high school, which Romney is not denying, seem to be forcing that shift sooner rather than later, and not in a way that is particularly favorable for Romney. The lines are very clearly drawn: A candidate who many Americans will see as having gone too far by openly supporting something that makes many Americans squimish vs a candidate that many Americans will see as having gone too far the other way as the leader of hate-crime activity. Honestly, I am not sure which way the vote will go on this aspect. Interesting fact regarding another facit of presidency by the way: This will be the first presidential race in 70years where neither candidate is a military veteran. It's interesting that the Republicans are selecting a candidate who is lacking experience in the same areas for which Obama was so heavily criticized in 2008, namely foreign affairs and military. Glenn wrote: It's interesting that the Republicans are selecting a candidate who is lacking experience in the same areas for which Obama was so heavily criticized in 2008, namely foreign affairs and military. Yes, but which candidate should the party have chosen based on these considerations? And if there really was none, why is that and where are these candidates, if any exist? STEVIE B FOR DICTATOR AND CHIEF!!!!! FREE AWAMORI FOR ALL UECHIKA FOREVER!!!!! mhosea wrote: Yes, but which candidate should the party have chosen based on these considerations? And if there really was none, why is that and where are these candidates, if any exist? I personally think the perfect candidate (for either party) will never run because they would be too smart to want to be president! Stevie B wrote: STEVIE B FOR DICTATOR AND CHIEF!!!!! I think we should start a write-in campaign for Bill! Ok, yes, I know, the media by and large will be looking to make the economic outlook rosier as we get closer to the election... I just don't know that most Americans will believe it. Glenn, Candidate Obama wasn't criticized for lack of experience in foreign policy or military matters... he was criticized for having absolutely no experience in ANYTHING!!! What matters most is whether the constituencies that barely carried Candidate Obama to the Oval Office can be inspired to do so again. I'm betting not. Social Conservatives and gun owners will turn out in droves to bury the boogeyman. You won't see Blacks turn out in droves to keep Romney out of office, but you might see less bothering to vote for Obama a second time. The economy is not improving with the kind of numbers Obama will need to stay in office, either. You can't come into one of these discussions with a drive-by line like that and not support it with data and/or references. Let me help you out a little. The jobless rate was 8.1% in April, mostly because many frustrated job seekers dropped out of the labor force and thus are no longer considered unemployed. The economy turned in another lackluster month for job creation in April, with 115,000 net new jobs, 130,000 in private business (less 15,000 fewer in government). The unemployment rate fell a tick to 8.1%, albeit mainly because the labor force shrank by 342,000. This relates to what is arguably the most troubling trend in the April jobs report, which is the continuing decline in the share of working-age Americans who are in the labor force. 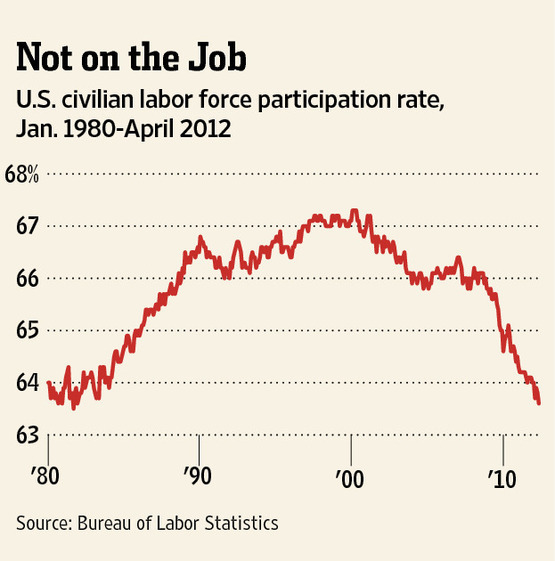 The civilian labor participation rate, as it's known, fell again in April to 63.6%. That's the second decline in a row and the lowest rate since December 1981. That's right—more than 30 years ago, longer than Mark Zuckerberg has been alive. The nearby chart shows the disturbing round trip the workforce participation rate has taken since 1980 and the precipitous drop in the last three years. Who was president in that time period? Who was president when the upward slope flattened, and how many terms did he serve? Did you notice this statement in the article? "the precipitous drop in the last three years"
Glenn wrote: I think we should start a write-in campaign for Bill! I'm not one to over-interpret the daily squiggles of the stock market, and the same can be true for these polls. Truth be told... when a minority candidate is part of it all, you can get untruthful results. People sometimes say one thing to a pollster and then vote differently when anonymous and behind the voting curtain. I think Obama wanted to take the debate off the economy. Contrary to Glenn's proclamation, it isn't doing well at all per the data I just posted. I could name you names that many here know who have given up looking for employment. This isn't reversal of women going into the workforce, choosing instead to be stay-at-home moms. Many who are quitting are males whose jobs have gone and prospects disappeared. These are highly educated folk who try for a "lesser" job and can't get hired because they're "overqualified" (in other words, the employer knows they'll split as soon as a better opportunity comes). And the longer they stay unemployed, the more unemployable they become. Going back to school when you already have an MBA is a non-option. Housing prices have dropped precipitously, and so there's no reason to build except in a few markets. There's a glut of repossessed homes. Without new houses being constructed, there's a whole "construction" portion of the economy that's brutally stagnant. And it isn't just in the private sector. Post Offices around the country are cutting back on facilities and considering dropping Saturday mail delivery. (This isn't all bad. Snail mail is waning anyhow.) Then we have members of the military coming home being thrown into the job market. A few companies like my own are making goals of hiring X number of veterans by Y date, but then that means others don't get those slots. The gay marriage statement - and that's all it was - is a distraction. On the net it very well may hurt him. Blacks and (largely Catholic) Hispanics on the whole are against it, and so may stay at home on election day. It was a calculated risk. Yes, he energizes one portion of his base. But mostly he distracts the electorate away from his weakness - his management of the economy. It also distracts the electorate away from his pressing for the largely unpopular trillion-dollar health care bill. Instead we get the press and voters quibbling over how Romney should respond and what social conservatives think. And the media largely will give him that bandwidth - and for quite a while. Bill Glasheen wrote: You can't come into one of these discussions with a drive-by line like that and not support it with data and/or references. Not a drive by Bill, I was just considering the past three years rather than than past month. According to the BEA, unemployment is down 1.9% since its peak in 2009, and that overall trend is not just job seekers dropping out. Meanwhile change in GDP went from -2.5% in 2009 to +4.2% in 2010 and +3.9% in 2011, and that was while conditions have been worsening in Europe, although as the data you present suggests that may be catching up to us. To hear most economists tell it, the prolonged recession has caused millions of Americans to leave the labor force. Perhaps though there’s another story there. Maybe it’s just the baby boomers. Baby boomers, the generation born between 1946 and 1964, started reaching the conventional retirement age, 65, last year. That would certainly have many of them leaving their jobs and heading toward the doors. It’s their exit from the labor force that could explain why the labor-force participation rate has fallen from 66% at the end of 2007 to near 63.9% today, a group of Barclays Capital economists argue in a new report. This would be good for the bearish holdouts on the economic recovery. Those skeptics say the dropping unemployment rate mostly is from a drop in able-bodied people quitting the job search (and lowering labor force participation). And, they say, when the economy does pick back up, those folks will want back in. So, when they re-enter, the falling unemployment becomes the rising unemployment rate. But if the Barclays economists are right, and the labor-force participation decrease is from baby boomers retiring, then we won’t see a large increase in labor force participation later. Or a rise in the unemployment rate. To make up for this trend as it runs its inevitable course we will need to either bring in workers from other countries or export even more work to other countries, or accept shrinking productivity. Last edited by Glenn on Mon May 14, 2012 3:02 pm, edited 3 times in total. Jason Rees wrote: "...steadily improving economy..."
Well obviously Romney believes it and is worried about Americans believing it, otherwise he would not be so focused on claiming that he could make the current recovery go FASTER. Actually y'all did criticize Obama specifically for lack of experience in foreign policy, and discussed at length on how y'all thought McCain's military experience would make him a better commander in chief than Obama. Yet y'all have been silent on Romney's similar lack of experience this time around. A victory by over 9.5 million votes (7.2 percentage points) and 192 electoral votes (35.6 percentage points) hardly counts as "barely carried" to the White House, it was not even close. And even if one wants to think of it as close, at least Obama was elected by the VOTERS into his first term. American workers are increasingly planning to delay retirement. Among employed adults ages 50 to 61, 60 percent say they may have to delay their retirement because of the recession, according to a Pew Research Center telephone survey of 2,967 adults released today. And 35 percent of those age 62 and older say they’ve already pushed back their retirement date. Similar articles can be found in the Wall Street Journal (fiscally conservative) and Huffington Post (uber liberal). 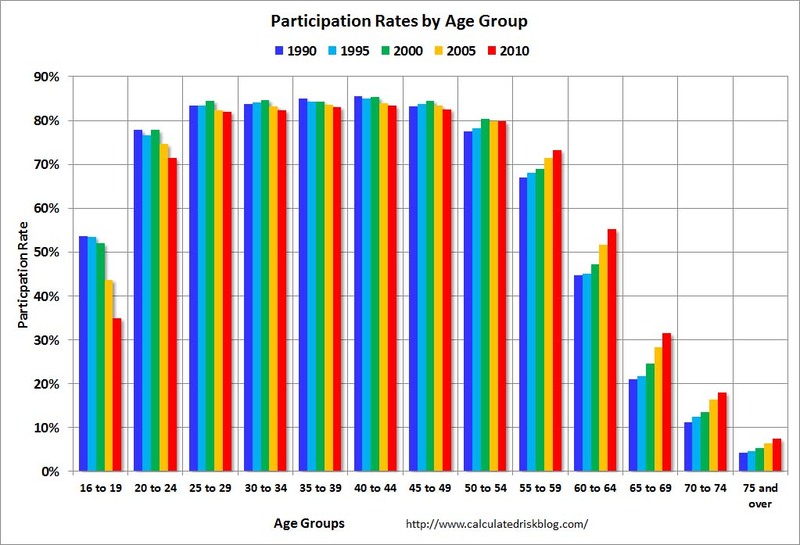 Here's a breakout of Labor Force Participation by Age Group over time. And guess what? The boomers are increasingly deciding to stick around. The recession has diminished their nest eggs, making it impossible to leave the labor force. As this chart shows (and it gets worse beyond 2010), the younger folk (ages 16-44) are dropping out of the labor force, while the labor force participation rate is increasing for the older folk (ages 45 and above). Boomers are doing the exact opposite of what you say. They're clinging on to their jobs because they can't retire. And they can't go home and live with their parents, because they're dead or in the nursing home. As for the unemployment rate, that peaked on Obama's watch. It peaked far above where he said it would (he predicted a max of 8.1%) - even ignoring the precipitous dropping of the labor force participation rate. People are hurting, Glenn. You don't think they are? Wait and see the bloodbath in November. As has happened in Europe, incumbents are toast. Nothing personal, mind you. As for experience... Jason is correct that Obama had no executive experience and no military experience before entering office. He was neither governor nor manager of anything nor leader of any kind. Romney has leadership experience both as governor (which is why more governors end up as president) and in the private sector. He also had to create and operate on a budget both in the public and private sector. Obama never did, which explains why he's increased the debt far more than any president before him. Military experience? Again... Obama had none. As governor, Romney was commander-in-chief of the state national guard. Yes, that counts - particularly with the country at war. Once again, it's a reason why more governors end up in the White House.